My Sunday School class wants to study the book of Exodus. In order to avoid a long, boring, drawn-out chapter study that goes on indefinitely, we decided to take a big-picture approach to the development of the book. Exodus, as most of my readers may know, is the story of how the Children of Israel--through Moses--were delivered from Egypt. Most importantly for this study, however, is the fact that through these events, Judaism as a religion was refined. Consider the quote from John 9. It is clear that the Pharisees looked to Moses as the original mouthpiece of God. They knew that Moses was vetted & proven to speak what God had delivered to him. Therefore, they clung to Moses' writings as gospel (so to speak). This makes sense since the so-called Dispensation they were in is the Dispensation of the Law/Mosaic Dispensation. The book of Exodus can be seen as a transitional period between Patriarchal Rule to the Law. Midwives fearing God & acting on their moral instinct to save the babies (1.15-22) / Ten commandments given to explicitly prohibit murder. The people groan about their burdens but do not direct prayer to God (2.23-25) / People given instructions on how to draw near to God. Moses not recognizing the presence of God, the holiness of God or the consequence of drawing near when unclean (3.1-6) / Explicit instructions given for the construction of the tabernacle which includes a designated Holy place & rules for access. There are many ways to dissect & apply a portion of scripture. I am certain that there are many ways to conduct a study of Exodus, this is only one way. The point of this study is order. God is a God who wants things done decently and in order. And by the way, 1 Corinthians 14 is all about your behavior in the house of worship, so it works in harmony with this general theme. Structure in the Church is shunned in some of the circles of which I am a part (low-church). The term "Religion" carries a lot of baggage which it really shouldn't. God established a means to dispense his Grace upon us & we should embrace that. 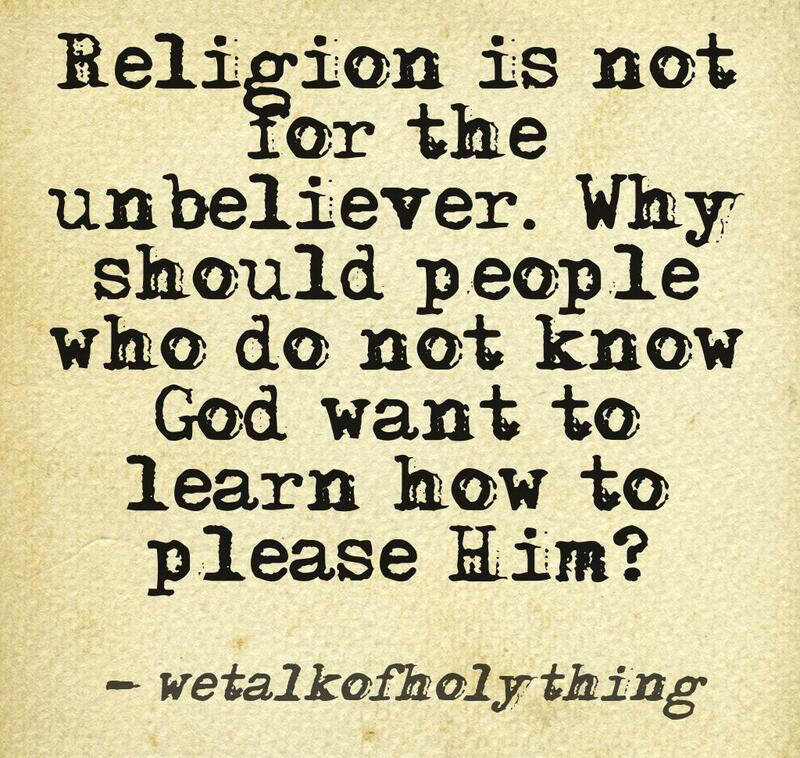 Realize that Religion is not for the unbeliever. 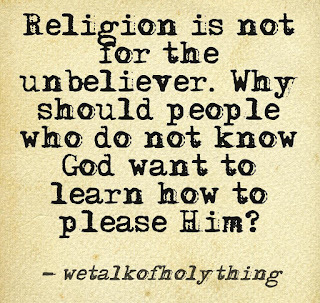 Why should people who do not know God want to learn how to please Him? Only those with a relationship with Him will have the desire to submit to His will. Conversion takes place outside of Religion, growth should take place inside.